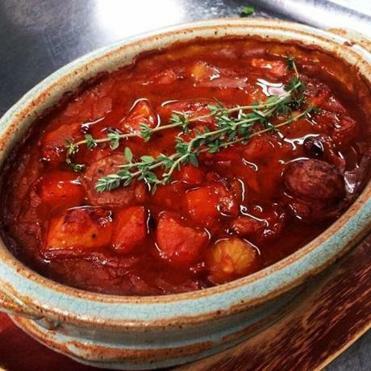 At Peasant restaurant in Waitsfield, Vt., chef-owner Chris Alberti offers up such dishes as a cassoulet. WAITSFIELD, Vt. — The dark red tomato sauce slowly simmers in a well-worn saucepan, filling the small kitchen of Peasant, a restaurant here, with the warm scents of an Italian home. The recipe, passed down from chef-owner Chris Alberti’s grandmother, is considered unconventional because it uses red onions. They are cooked with garlic in red wine, the mixture reduced until caramelized. It accounts for the sauce’s rich burgundy color. The story of the chef is unconventional as well. Alberti spent decades within New York’s great restaurants — some world famous (Peter Luger in Brooklyn, Rao’s in East Harlem), others local institutions (Raoul’s in SoHo, Il Mulino in the West Village). He wasn’t cooking, mind you. He was a customer. Alberti never worked a single day in a restaurant before he decided to open one. That was after everything had changed. He was a bond trader working on the floor of the New York Stock Exchange. On the morning of Sept. 11, 2001, his morning commute had him leaving the World Trade Center just moments before the first plane hit. Along with their five children, they moved to the Mad River Valley, a beautiful area as well known for its farms, food, and breweries as it is for its skiing. Many people talk about starting all over. Harnessing the sheer will to uproot themselves to begin a new life and career. Most do not. At age 50, Alberti did. But the new chef didn’t pick an easy career or place to open. The valley, home to well over a dozen farms, embraced farm-to-table long before it was a popular movement. It’s a community where even the local hardware store advertises a poster for a CSK — community supported kitchen — and area chefs deliver organic dinners to convenient pickup points throughout the region. Competition for area diners, and the ones who visit from Boston, New York, and New Jersey, is fierce. There is the Common Man in Warren, where Adam Longworth, formerly the chef de cuisine at Gotham in New York, puts out impeccably delicious, contemporary offerings in a beautifully refurbished barn. Also in Warren, there’s the Pitcher Inn, a Relais & Chateaux luxury hotel with award-winning dining. And plenty more. 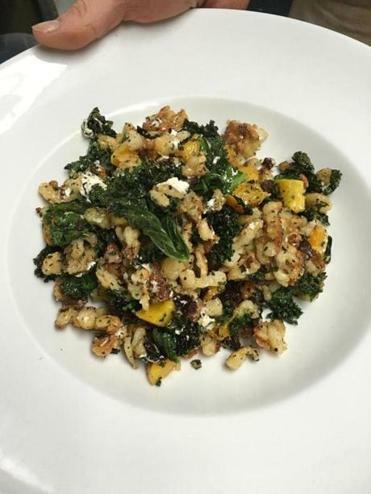 Spaetzle with kale, butternut and Vermont chevre. Now in his fourth year, the self-taught Alberti, who is frequently on the phone to Longworth with questions, is starting to find his rhythm in the kitchen. Peasant features standout dishes like spaetzle and sausage (both made in house) with squash, kale, and chevre, all from the farm down the street ($22). When I catch up with him, on a prep day (the restaurant is open Thursday to Monday), he is making another family recipe, beef and pork meatballs, meats sourced from the nearby Gaylord Farm. The meatballs are topped with the red sauce ladled directly from the nearby saucepan. Offered at the table with Parmesan ($12), they are a comfort-food explosion, the acidity of the red sauce just enough to balance each delicious bite. Alberti shares what the shift in lifestyle has meant for him. “I make in a year what I used to make in four weeks,” he says. “I wanted to show my kids that there is an alternative to making six or seven figures, that there can be a joy of life that’s not monetary.” One of Alberti’s sons works with him in the kitchen, and his three daughters are in the front of the house. If the former bond trader misses his past life, he doesn’t let on. 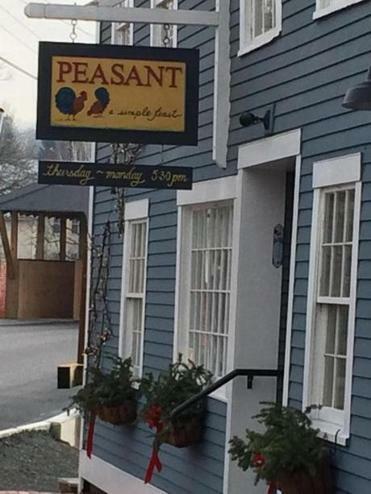 Peasant is open Thursday to Monday. Reservations are recommended. 40 Bridge St., Waitsfield, Vt., 802-496-6856, www.peasantvt.com. Mike Ross writes regularly for the Globe. Follow him on Twitter @mikeforboston.